Terror struck Mumbai when three serial blasts rocked crowded areas in the peak hour this evening in a space of 10 minutes killing at least 21 people and injuring 113 in a grim reminder of 2008 Mumbai attack. Maharashtra Chief Minister Prithviraj Chavan said at least 20 people were killed and 113 injured in the coordinated attack at Zaveri Bazar, Opera House and Dadar. The blast at Opera House was the "most powerful", he said. The explosions, which ripped through the country's financial capital, went off just few minutes apart between 6:45 and 7 pm. "Therefore, we infer this was a coordinated attack by terrorists," Union Home Minister P Chidamabaram told reporters in New Delhi, adding that the death toll could go up. 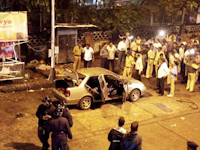 Improvised Explosive Devices(IED) were used to trigger the blasts which coincided with the birthday of Ajmal Kasab, the lone Pakistani gunman in the 2008 Mumbai attack, sentenced to death. 166 people were killed in the Mumbai carnage. 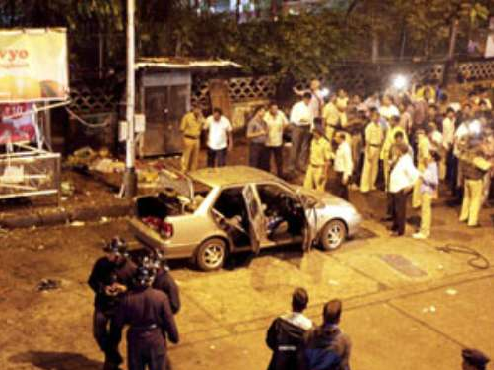 No group claimed responsibility but Mumbai police suspects the hand of Indian Mujahideen(IM). Chavan declined to speculate on who could be behind the attack. Mumbai police commissioner Arup Patnaik said the blasts at Opera House and Zaveri Bazaar were of a higher intensity than the one at Dadar. "It is a terror act. Quite obvious that some terror element is involved in the attack. Zaveri Bazaar blast exploded with use of IED kept in an abandoned umbrella. All three blasts occurred between 6.50 and 7 pm," Patnaik said. He said the NSG hub in Mumbai has been put on standby and that the elite force's 'post-blast' team has also been sent to the financial capital of the country. The Central Forensic Science Laboratory (CFSL) team from both here and Hyderabad has been sent to Mumbai, he said. An NIA team led by an IG rank officer will also leave for Mumbai, he said. PWD Minister Chhagan Bhujbal said it is clear that the attackers in the biggest strike since 26/11 wanted to "hurt as many as people as possible."